This Christian movie is the first film produced by Sherwood Pictures, the company formed by Alex and Stephen Kendrick. Originally this movie was made for the use of the local church, Sherwood Baptist Church and its ministry. But when the film was finished, it was released for public viewing and it became a spectacular hit. Inspiring many who went to see the movie and it was the start of what would become a well-known Christian production company and the beginning of great faith-based films for the enjoyment of the whole family. 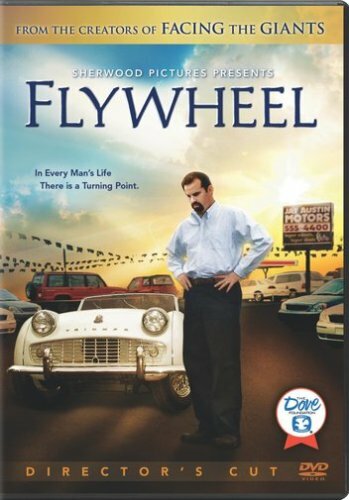 Flywheel is about a fraudulent used car salesman who chooses to be a worthy salesman in God’s eyes and is set to encounter the surprise of his life. Jay Austin (played by Alex Kendrick) from Flywheel is a used car salesman who usually scams his customers and even goes so low that he scams his pastor. This is the way he’s done things for a while in the car lot and the way he’s trained his employees, for example, Bernie and Vince. For a while now Jay has gone to church only because his wife Judy wants him to, not because he truly wants to be there, also says he’s going to donate to the church but never does. His wife and son are aware of Jay’s fraudulent behavior and frown upon it. It has come to a point where it’s definitely causing a negative effect on their relationship as a family. Apart from things not going well at home, in his lot things aren’t looking so well either as it’s in jeopardy of foreclosure by the bank. Jay is constantly thinking of all these things and has become guilt-ridden. In one occasion while watching television, he sees a preacher talking about how a person’s current situation is a result of the person’s choices. This completely makes Jay reflect and accepts Christ again in his life reassuring that he cannot engage with things he did before. He apologizes to his family and makes a decision that he had to be an honest businessman. Little did he know that his most troubling times were to come. Now Jay is in a huge debt and is prone to lose his car dealership if he can’t pay the bank all the payments he owes. Because of his newly-found commitment to the Lord he chooses to leave the situation in God’s hands and declaring that that place was His. Kevin, a young man, visits Jay and asks to work for Jay for a few weeks and asks about his strategy in selling cars. Jay teaches Kevin to sell the cars at the price they’re supposed to be sold as. Some sales have been made but quite frankly, the amount Jay needs to pay the bank hasn’t been reached in sales. A few weeks later after Kevin had finished his time at the car lot, Jay sees him on television on a news segment about investigations on car dealerships. To Jay’s surprise, Kevin was, in fact, an undercover agent trying to discover which car dealers scammed their customers. In the report, it’s mentioned that Jay’s car dealership was the only dealership who he had investigated that offered honest prices. The next day after the news report, many people arrive at the lot wanting to buy cars. Not being prepared for this amount of people in his lot, Jay calls his friends and family to help him. After the big sales, Jay discovers that the total of the sales made is plenty to pay the debt he owed the bank. In fact, a banker visits the lot and is surprised at what Jay has achieved. The dealership’s business continues to do well and the lot stays afloat. But now even though things are going good, Jay still has all those people he scammed before in his mind. He decides to give money back to the customers he had previously overcharged. When Jay from Flywheel thought things were finally going well, one of his previous employees is badmouthing him and his car dealership which does not help Jay’s new way of managing the lot. But the customers who Jay had given their money back made sure to voice the truth. Flywheel is an excellent movie to watch and with a great lesson. Dishonesty is definitely not the way to go around things, it’ll just make things worse. If you’d like to watch this Christian movie, be sure to find it here in www.fishflix.com!